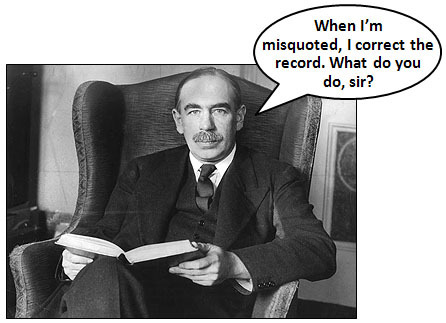 Who Put Words in Keynes’ Mouth? There’s just one problem with both these quotations: No one can point to a primary source proving that Keynes ever uttered them. These two quotes, which really need to exist even if Keynes didn’t utter them, join loads of others that apparently never got said either. Like this one and this one, for example. Zweig has offered ten dollars each to anyone who can find a primary reference for the Keynes quotes, but I’m willing to concede right now that he’ll probably be able to hang on to his sawbucks. I’m more interested in something else: who made up the quotes? As a social phenomenon, that’s really more intriguing. Someone, somewhere, invented these quotes, and they sounded so much like Keynes that they’ve been almost universally accepted ever since. Who knows? Maybe they were accepted even by Keynes himself. One of the linked quotes above is from Everett Dirksen, who was alive while he was being misquoted all over the place but just never bothered to correct the record. So this could go back a long way. Anyway, fine: Keynes didn’t say this. So who made up the story?